I have been harvesting the red potatoes I planted in January. So far I have pan fried them, made Indian potatoes, and deep fried them. Just last weekend, I have deep fried all sorts of garden veggies for my herb class. If you ever cooked for others, you know that you generally don't get to eat much. I was feeling hungry this afternoon, and as usual, there are hardly anything in the fridge other than jars of assorted homemade pickles. I went out to the farm and started digging into the potato patch. I found a few decent size potatoes, washed them, and thinly sliced them. I used the same setup as last week - flour, egg wash, and panko. Instead of using the deep fryer, I used my cast iron pan on the stovetop since I was only going to fry a small quantity. 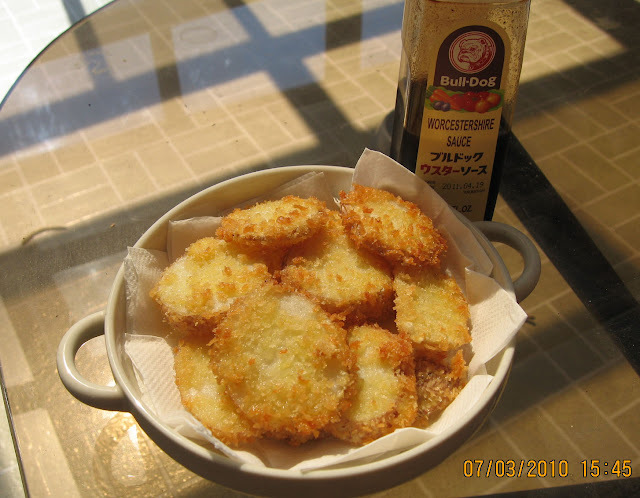 The panko coated potato slices were fried to a nice golden color. I like to eat these potato tempura with Bull Dog Worcestershire Sauce. 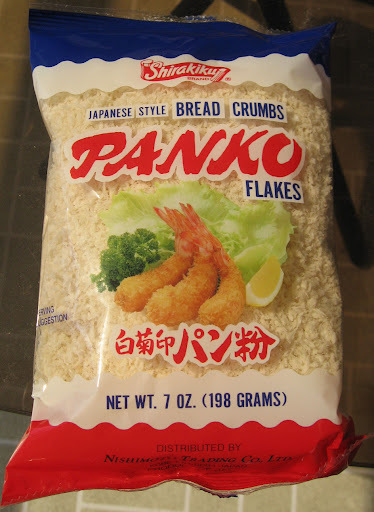 Many people asked me about this "panko" (パン粉) I used last weekend. This is Japanese style bread crumb, the same stuff for making shirmp tempura, tonkatsu, and croquettes that you get in Japanese restaurants. Last Thanksgiving, I made Alton Brown's Green Bean Casserole and panko was one of the ingredients. It's a recipe I will definitely use again.